Working with some great Gold Coast Construction Companies, in some awesome locations. Termites are ferocious and never give up. Easy to say, 1 in 4 homes are attacked by Termites, well it is more like 1 in 3 here on the GC. Protecting new homes from Termites during a new Build or Extension here on the Gold Coast Queensland is an essential requirement. There are many options when it comes to protecting a new home, however it is best to understand the basics to ensure if you are the builder or the owner builder you do not begin to build before you engage a Termite Management Expert. 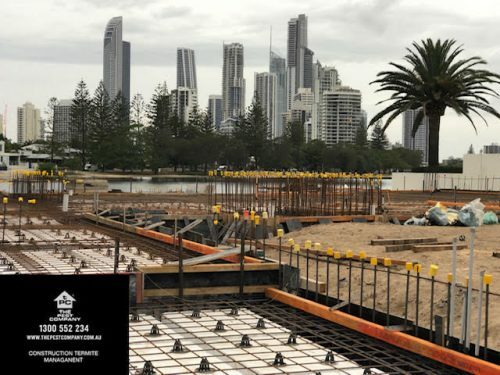 The Australian Standards AS3660.1-2014 and the National Construction Code, along with the product manuals and systems that form the overall scope of the requirements to install Termite Management Physical and chemical Systems in Australia. On Completion of all our installations you will receive a Certificate of Installation and a label to be placed in the meter box. In Queensland we will also supply a form 16. If you are looking to engage a Termite protection company on the Gold Coast you can call us 1300552234 or email us the plans (Architectural and Engineering Plans are best), from here we can inform when the Termite Management System is required to be installed during the build, best to remembering to “Call before you Pour”. Most residential homes begin with the Termite Management being installed prior any slab, Brick work, Masonry Block or Timber Framing. In a nutshell, call us before you start anything. 1300552234. 0424 415300.